One of my favorite traditions while growing up was our Christmas Eve celebration. It always started with the children's mass at church, even when we did not have any children with us. Then we would all go back to the house and Santa would visit us each and every Christmas Eve. It was my most favorite part of the holiday season. Each and every one of us, young and old, sat on Santa's knee, gave him a kiss, and got a gift in return. We would take a group shot before Santa left. Next, we opened all our gifts followed by snacks and card games late into the night. While Christmas Eve's now are different than they were, we still try to incorporate Santa's visit in my immediate family when we can. This tradition didn't just start in my generation, Santa even came when my Mom was young. 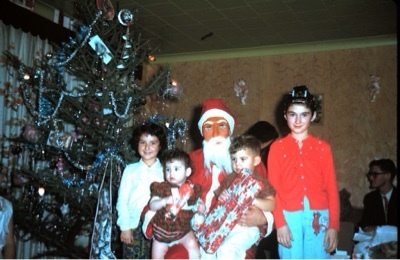 When my Mom was young, it was her Dad, my Grandpa, that always dressed up as Santa. This photo is of my Mom and 3 of her siblings. When my Mom sent me the photo, the resemblance between her and I as young girls was uncanny. She is on the far left in the photo. 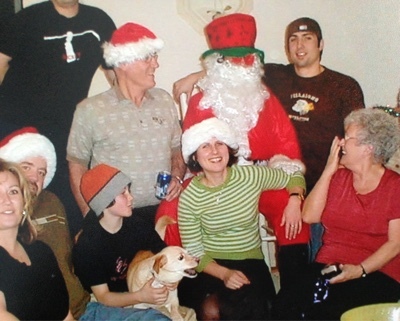 When my Grandpa passed away it was a tradition that the family wanted to continue in his honor, the question was, who was going to be Santa? You see, my Mom comes from a family of women. My Grandma has 5 daughters and 2 sons. Of the 2 sons, neither was home for Christmas on a regular basis. In the end, my mom volunteered. 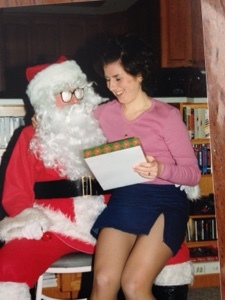 Thirty years later and my Mom still dresses up as Santa Claus every year we come home for the holidays. In the early days, my mom would go downstairs with my Grandma to put on the outfit and have a shot of whiskey to tame the nerves. For real. 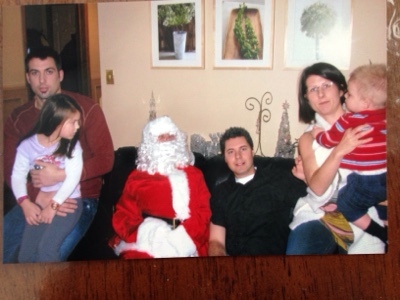 Each year, every person got a photo with Santa. This is my brother sporting a mullet and a perm. For a boy, he had more hairstyles then I care to remember. This is me at about 20 years old. Notice the very high slit in my skirt in this photo. This was shortly after I lost all my weight and my clothes got a little tighter and shorter. I sure hope Santa gave me a few fashion tips before giving me my gift! 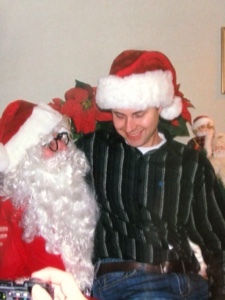 Notice Santa's glasses in this photo. 'He' always came from outside so the younger kids could watch from the window. It must have been particularly cold this winter as his glasses were all foggy. 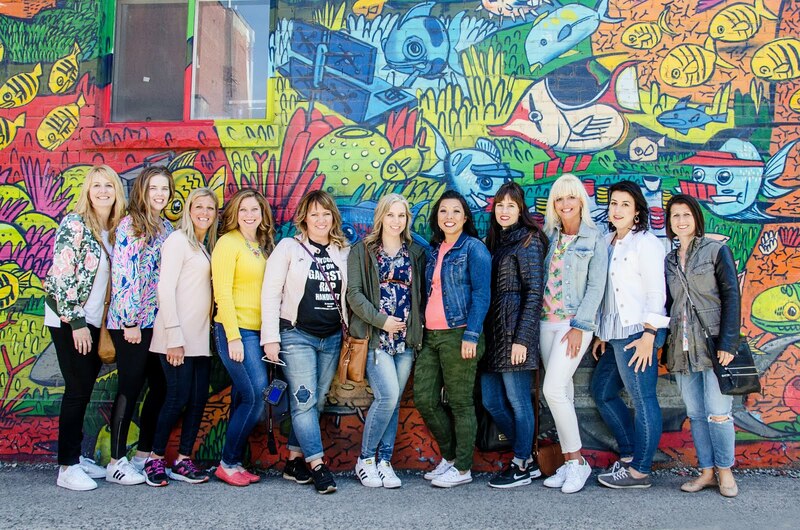 Each year we also snapped a photo with the group that was celebrating Christmas with us that year. It varied from year to year with the exception of a core group. Santa always made us sing a Christmas carol before he left. Usually We wish you a Merry Christmas. Some years Santa would even dress up in crazy hats and glasses. The look of my Grandma's face is priceless. Maybe that was the year that Santa had his mustache over his nose instead of under. Maybe too many shots of whiskey? 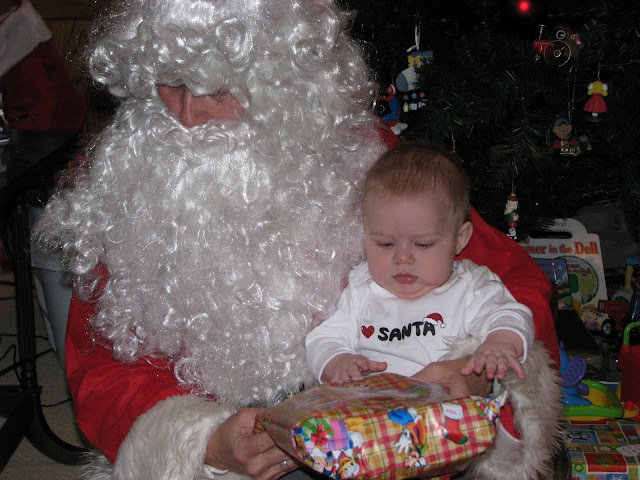 For Grady's first Christmas, Santa made a special visit to our house. And for Cooper's as well. He was only 7 weeks old for his first Christmas. Notice the look on my niece's face. She was about 5 in this photo and was on to Santa being fake. After Santa left she asked if Santa was a woman... priceless! The other thing I love about having our very own Santa Claus visit is that we have not waited in line at the mall. Not even once. While others may deem this a Christmas tradition that they can't imagine not doing, I am so happy that we have our own personal Santa visit us at home. No lines and no crying. Usually. What I love about this tradition is that is was unique to our family. None of my friends open all their presents on Christmas Eve, I have yet to meet someone that celebrates this tradition. 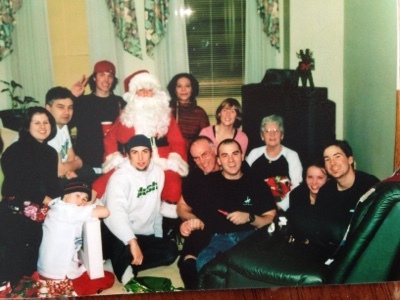 Other than my BFF Dee, I also don't know anyone that has a real life Santa come to their house every Christmas. 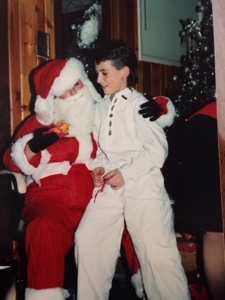 Growing up, I loved bragging to my friends about my special visit with Santa and how i got to open my presents early. It was our family thing and I loved it. As we have gotten older and family dynamics have changed, the tradition has changed to. Santa still comes every year, but not always on Christmas Eve, instead, we pick a time when the family is all together, sometimes earlier and sometimes later. One thing that hasn't changed is our celebration on the Eve of Christmas. We still open our presents at night. It allows us all to sleep in on Christmas morning, if you count 7:30 as a sleep in. I love hearing about the different traditions that other families do to make their holidays unique to them. If you have a favorite tradition unique to your family, please share it in the comments, I'd love to hear how YOU celebrate!